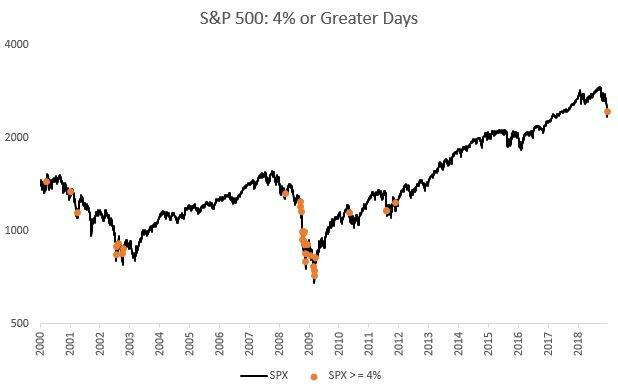 On any other day, a 1.5% drop in the S&P futures would be cause for alarm; however after yesterday's historic 5% surge in US stocks it merely prompts a shrug, because even with ES sliding -36 points, it is roughly where it was trading at 3:35pm yesterday. 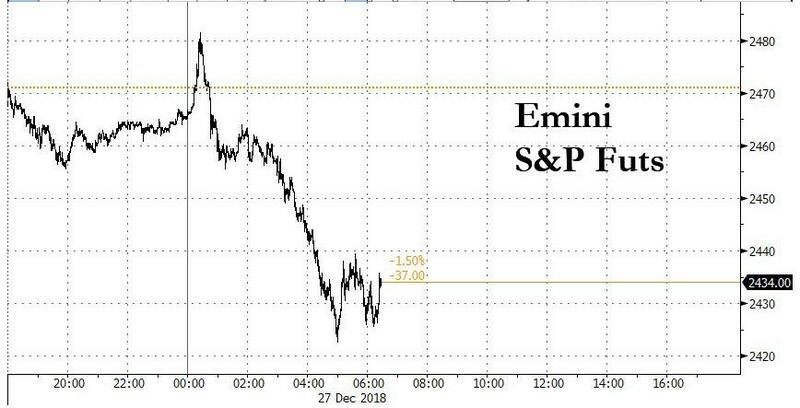 ... nearly a third of yesterday's rally fizzling, wiped out in overnight trading, with S&P futures sliding for the past 6 hours and after an early spike which pushed the Emini briefly above 2480, the contract has since dropped as much as 60 points and is prompting renewed concerns about the sustainability of yesterday's bullish reversal. That said, even with the previous session’s surge, it’s still a horrible month for American stocks, with the S&P 500 down almost 11%. Meanwhile, even as futures dropped, world stocks bounced off a near two-year low on Thursday, lagging Wall Street's dramatic surge, though the first fall in Chinese industrial profits in three years and renewed Italian banking worries offered a sobering reminder of the problems weighing on the world economy. “The relentless selling which prevailed leading up to Christmas has mercifully halted as U.S. stock markets recorded significant gains,” said Stephen Innes, trader at OANDA. According to Innes, the rally was partly due to a Mastercard Inc report that sales during the U.S. holiday shopping season rose the most in six years in 2018, helping allay concerns about the health of the U.S. economy. "The surge in online purchases over the holiday season should be a reminder for the markets never to underestimate the purchasing power of the U.S. consumer." Stocks in Asia and Europe took their cue from the Wednesday rally and opened strongly, pushing the MSCI world equity index, which tracks shares in 47 countries, 0.4% higher. The index had already spiked 2.3% in the previous session, rising off a 22-month low hit on Christmas Eve. 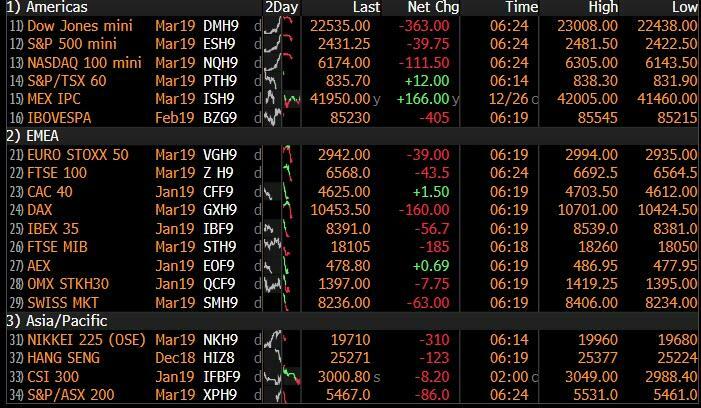 However, the global rally fizzled in Europe where shares opened higher 0.5%, then erased most of the early gains and the Stoxx 600 was trading down -0.9% at last check, dragged lower by Italian stocks. Milan was hit by renewed concerns over the country’s banking sector after lender Banca Carige was denied a cash call by its largest shareholder. The news weighed on Italian government bonds too, curbing a month-long rally and pushing 10-year yields higher on the day. Earlier, MSCI’s index of Asia-Pacific shares ex-Japan rose 0.6% and away from eight-week lows while Japan’s Nikkei managed to pull out of bear market territory, to closing 3.9% higher while Australian shares jumped 1.9 percent. But Chinese shares did not join the rebound, with mainland shares closing at session lows as well as Hong Kong down 0.4 percent. The Shanghai Composite Index erased morning advance and closed at session lows as China Petroleum & Chemical Corp. fell the most in more than two months, after Sinpoec shares tumbled as much as 8.6% after the company announced that Chen Bo, president of Chinese oil trading giant Unipec, and Zhan Qi, co.’s communist party secretary, have been suspended. 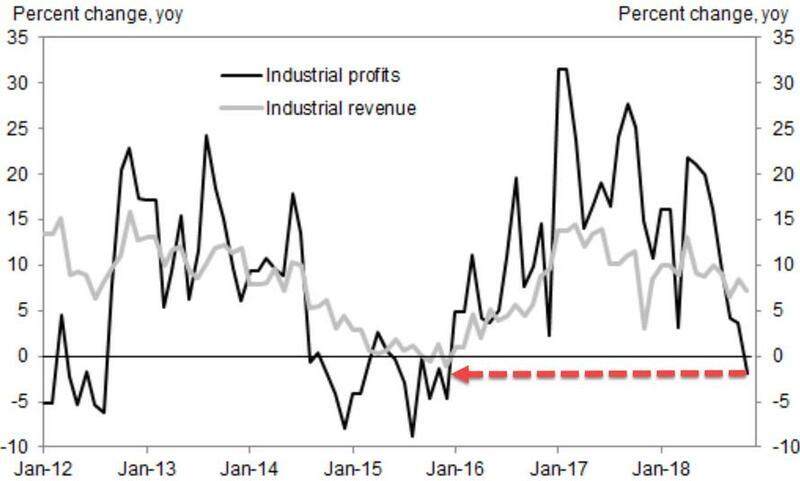 Also, as reported previously, earnings at China’s industrial firms dropped in November for the first time in nearly three years. Meanwhile, US Treasuries led advances in global bonds amid renewed skepticism about recent risk-asset gains and rekindled demand for the safety of government debt. Yields on 10-year U.S. notes fell toward the lowest level since April as the market was supported by a futures block trade equivalent to a DV01 of $717,000. 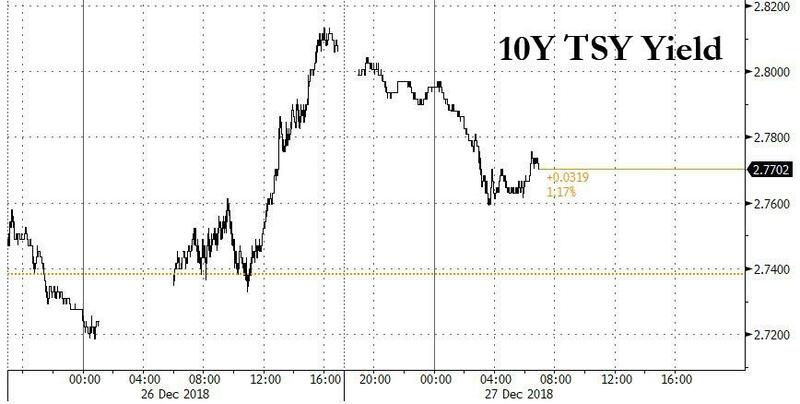 As a result, the 10Y has cut its losses in half, and was yielding 2.772%, 5bps lower than where it closed Wednesday's session. The dollar also gave up some of its overnight gains, but losses were limited to around 0.3% against a basket of currencies. Against the yen, a perceived safe haven, it was off 0.5% at 110.82 yen. It had risen nearly 1% overnight, booking its largest single-day gain against the yen since late April. The Bloomberg Dollar Spot Index pared Wednesday’s rally with the dollar slipping against most peers; yen and euro both gained at least 0.4% while Aussie and kiwi drop on renewed China growth concerns. Commodities were also hit, with concerns over a faltering global economy and signs of a crude oil glut pressured oil prices, sending Brent futures 2.4% lower to $53.26 a barrel and partly reversing the previous day’s 8% jump, the biggest in two years. Another safe-haven, gold, was up 0.4 percent, remaining just below a six-month peak hit earlier this week. Profits of Chinese industrial companies fell for the first time in almost three years, highlighting the effects of slowing economic growth, falling prices, and the trade war with the U.S.